We feature hand crafted and unique jewelry made from gemstones mined around the world, such as Indian Moonstones, Topaz from Brazil, Larimar from the Dominican Republic and so much more. But our specialty is the jewelry we make from Amethyst we mine ourselves at the Four Peaks Amethyst Mine just 40 miles from Phoenix. This mine is one of the few operating gemstone mines in the US and it is right here in Arizona. These gemstones range in color from light fuchsia to deep dark purple. Much of the material has a red flash known as Siberian Red. Named for the Russian mine in the Ural Mountains and mined by the Tsars that first noticed this displayed red flash. 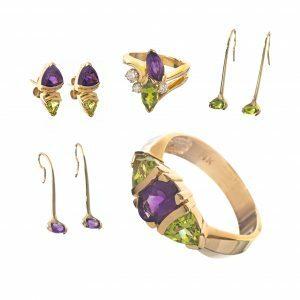 We feature hundreds of jewelry designs, but if you feel the urge to design your own, we have plenty of Arizona Amethyst and other loose gemstones that you can purchase and incorporate into your designs. This is a chance to own one of Arizona’s most beautiful native gems! A Certificate of Authenticity is available with the purchase of every Arizona Four Peaks Amethyst.